Colonel Sanders wants to come to your home: KFC said it will start delivering its buckets of fried chicken to customers in two U.S. cities. The chicken won't come cheap: There's a delivery fee between $4.99 and $6.99, depending on a customer's location, and prices of some items will be higher than those in the restaurants. Its value meals, however, such as its eight-piece $20 Family Fill Up will stay the same price. All menu items at the restaurant will be available to order, the companies said. KFC's rival Popeyes Louisiana Kitchen doesn't deliver in the U.S., but it does at international locations. Recently, restaurant chains have added delivery service in America. Chipotle, McDonald's and Starbucks work with delivery company Postmates. And Taco Bell, which is also run by KFC owner Yum Brands, works with DoorDash to deliver in certain cities. The chains partner with DoorDash and Postmates because they provide delivery people, an expense that the restaurants don't have to worry about. 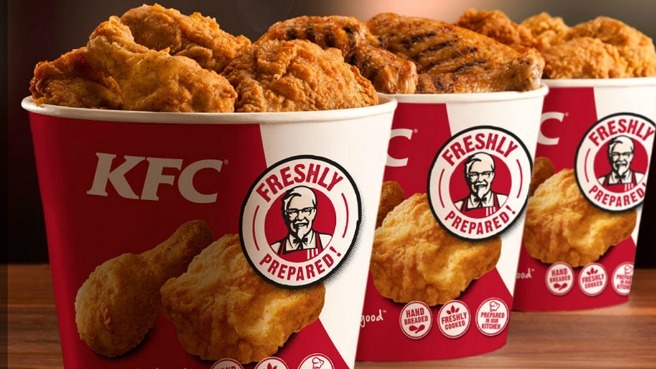 While it's a first for KFC in the U.S., it's common to see KFC being delivered in China, Egypt, Malaysia and other countries around the world. In fact, Yum Brands Inc. CEO Greg Creed said at a May conference with analysts that its delivery business usually grows at a "faster rate" than its main business. Last month, the company said its restaurants in China plan to expand delivery service in the country. "The great thing about buckets of chicken," Creed said in May, is that "it holds its temperature incredibly well."